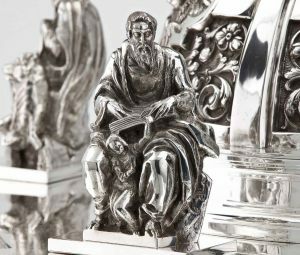 For over a century, the ecclesiastical metalwork produced by Talleres de Arte Granda has been renowned as the finest available. It embodies the artistic principles established by Fr. Felix Granda at the company's foundation in its precious material, careful craftsmanship and beautiful design. 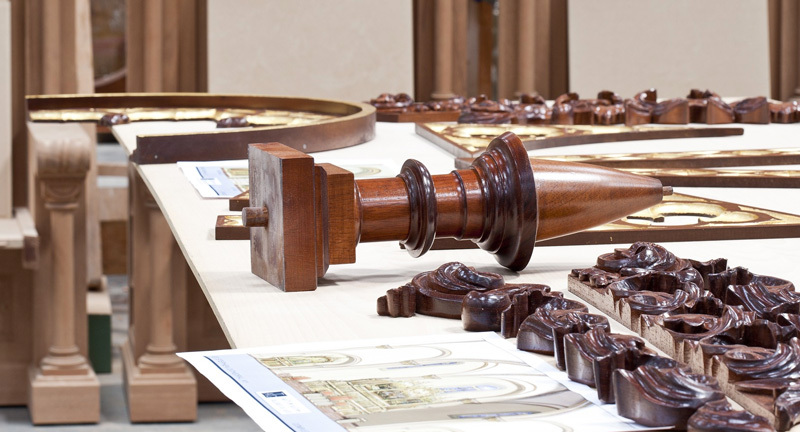 The designers and artisans have benefited from the artistic traditions they have learned from their predecessors, and from the study of the historic pieces collected by the company. The combined respect for tradition and creativity has always characterized the work of Talleres de Arte Granda and this is nowhere more apparent than in the custom metalwork designed specifically at the request of clients. The methods used by the metalsmiths and jewelers of Talleres de Arte Granda are conducive to customization, and include hand-chiseling and repoussage, inlaying of gemstones and precious material, and hand-painting of vitreous enamel on copper plates. The original design of new molds and models is also possible; computer draftsmanship and rendering allow such projects to be undertaken for significantly less time and cost than in previous decades. The workshops of Talleres de Arte Granda are able to produce any object of sacred metalwork or church plate. Our tabernacles are especially renowned, and are available in a variety of styles. 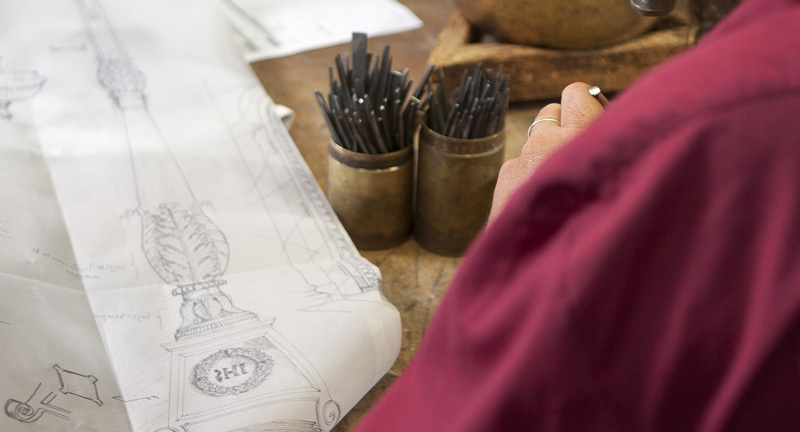 Our artists have copied historic models from the early medieval, Gothic, Renaissance and Baroque eras, and have designed new tabernacles according to historic conventions, taking inspiration from famous reliquaries, church facades, altar frontals and other works of art. 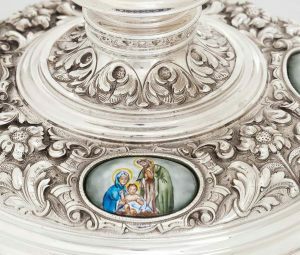 Modern styles including the Art Nouveau and Art Deco have also informed the design of custom tabernacles. The reliefs, enamel plates, marble colors and ornament on existing models can also be adapted to the needs of specific customers. Custom tabernacles in America include the Romanesque tabernacle in the Blessed Sacrament Chapel of Holy Cross Cathedral in Boston; the Ark of the Covenant in Our Lady of Walsingham Church in Houston; and the Eucharist Dove in the Carmel of Jesus, Mary and Joseph in Valparaiso, NE. Each of these is now a standard catalogue item. Other custom tabernacles by Talleres de Arte Granda can be found in the Church of Our Savior in New York City; the upper and lower churches at the Shrine of the Most Blessed Sacrament in Hanceville, AL; St. Augustine Cathedral in Bridgeport, CT; and St. Thomas Church in Ann Arbor, MI. Granda Liturgical Arts had assisted many seminarians in the design of custom chalices for their first Masses. 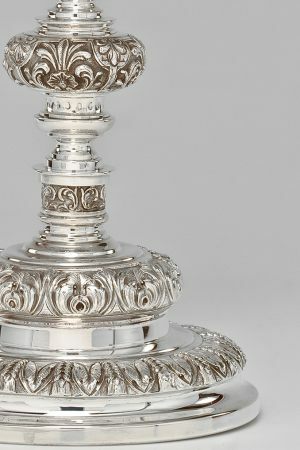 These range from copies of 19th century papal chalices to strikingly original designs. Modifications to the designs, enamel medallions, cabochons, and inscriptions on existing models are also possible. A chalice is the prized possession of a priest, which he will use through his entire life and which will remain as a lasting record of his service; the artisans at Talleres de Arte Granda are sensitive to this, and to the special significance of an ordination chalice to a new priest. 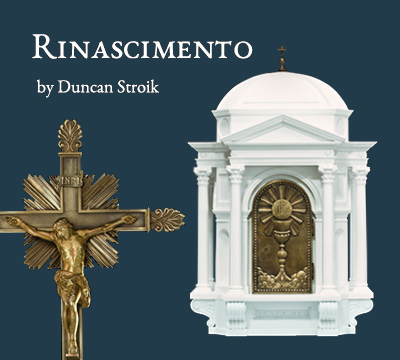 Custom vessels have also been commissioned by parishes, shrines, basilicas and cathedrals to reflect their own artistic and liturgical character. 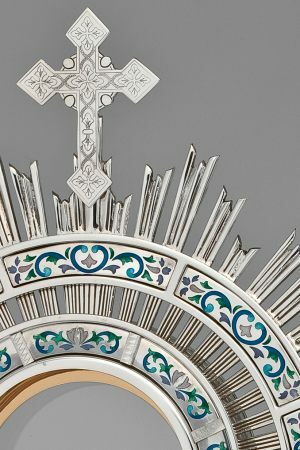 Especially notable are the sets of church plate designed for the Basilica of St. Teresa in Caracas, Sacred Heart Major Seminary in Detroit; and the Shrine of the Most Blessed Sacrament in Hanceville. Since the early 20th century, when public perpetual adoration of the Blessed Sacrament was first introduced to Spain, Talleres de Arte Granda has created exquisite monstrances for exposition and benediction. In recent years, Talleres de Arte Granda has made custom monstrances for the Shrine of the Most Blessed Sacrament; Our Lady of Corpus Christi Liberal Arts College; Calvert House at the University of Chicago; and St. John Cantius Church in Chicago. Beautiful custom reliquaries, candlesticks, processional crosses, evangelary covers, and thuribles are also possible; the artisans of Talleres de Arte Granda are able to fabricate any item of liturgical metalwork. Commissions for custom episcopal appointments including croziers and pectoral crosses are welcome. Please contact Granda Liturgical Arts to inquire about any of these possibilities. The staff there is eager to assist clients in the design of special items and to provide practical, liturgical and artistic research and advice. Granda Liturgical Arts will present the needs of the client to the Design Department of Talleres de Arte Granda, whose designers will provide sketches, blueprints, renderings, measurements and costs for the project.